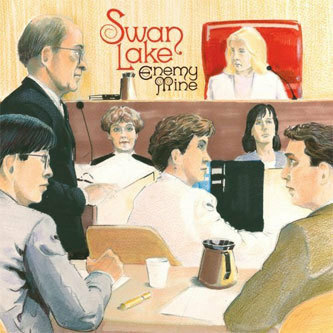 Anyone writing about Canadian band Swan Lake is obliged to use the term "supergroup". The three members should be listed as follows: Spencer Krug (of Wolf Parade, Sunset Rubdown and Frog Eyes), Daniel Bejar (of Destroyer, The New Pornographers and Hello, Blue Roses) and finally, Carey Mercer, who restricts his activities to Frog Eyes. Having released the fractious Beast Moans, their debut as Swan Lake in 2006, the trio have taken a more collaborative approach to this latest outing, and often, throughout its rich, mushy production you can hear the various players all piling up on one another's vocals. The result portrays three excellent songwriters all crowding in on one another, offering moments of occasional lucidity such as Bejar's quite wonderful 'Heartswarm', the snappy 'Paper Lace' and the retro synth-play of 'Spider', but Enemy Mine's idea-spillage means you're equally likely to encounter noisy, confused emissions whose beauty and eloquence are only unravelled after repeated listens.